"I’ve been worried like a parent." 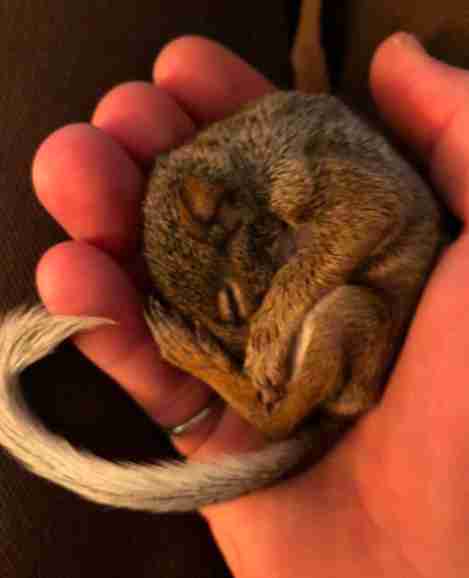 When Tyler Gregory found a little squirrel on his Kansas property last August, he knew he’d do whatever was needed to save the little life. 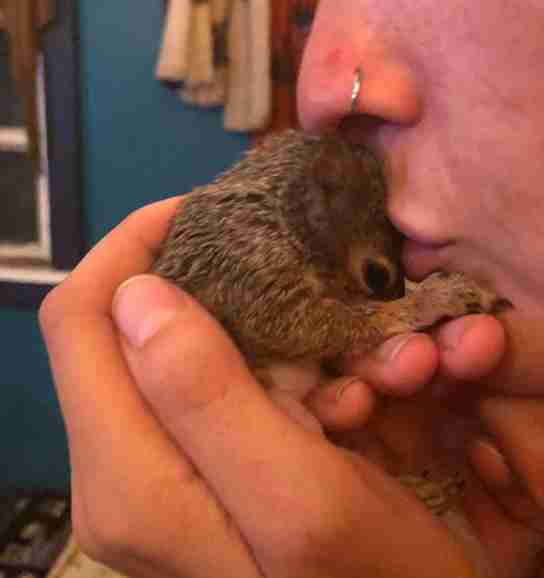 The baby squirrel was caught in a thunderstorm and had blown far from the safety of her nest and mom. Gregory brought the squirrel inside to warm up, but he was afraid she wouldn’t make it through the night. 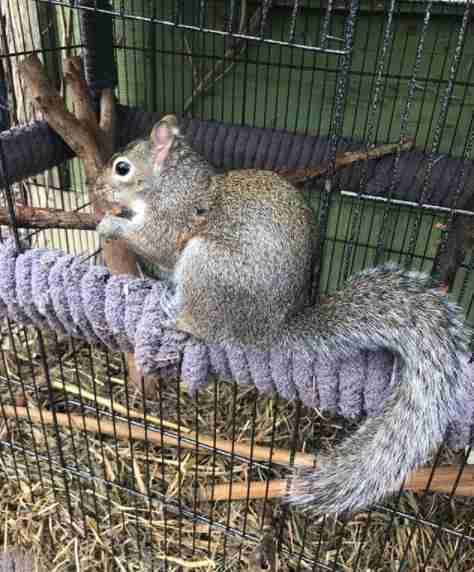 Gregory and his girlfriend set their alarm to wake them every three hours and took turns getting up for the frequent feedings. Luckily, their flexible schedules allowed them the time needed to care for the squirrel, whom they named Annie. “It helps with our work schedule since I’m a musician and my girlfriend works on her art from home,” Gregory said. During her first few weeks, Annie slept in a small cage with a heating pad to keep her cozy, and as she grew, so did the size of her crate. 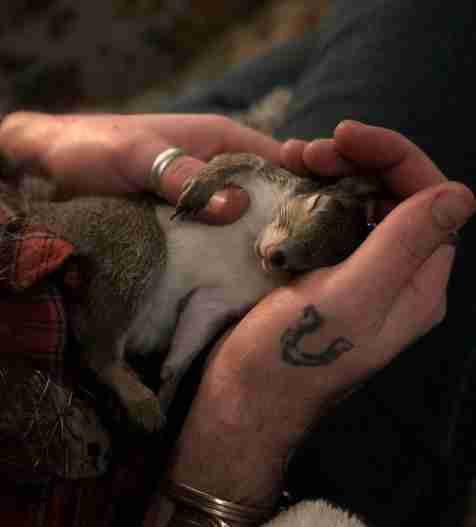 But as soon as her eyes opened, the curious squirrel wanted more room to roam — and her dad was happy to appease her. Gregory began taking Annie on frequent trips outside, where she could crawl around on the grass. Soon, the little squirrel was testing her strength by taking flying leaps from tree stumps and fence posts. But no matter how far she went, she would always run back to her dad for some neck scratches and — her favorite — belly rubs. When Annie wasn’t riding around on her dad’s shoulder or crawling through the maze of his hair, she would hitch a ride on the back of her dog brother. In November, Annie climbed her first tree — a clear sign to Gregory that she was getting ready to strike out on her own. However, inclement weather delayed her parting. Gregory wanted it to be Annie’s choice to leave the nest, so he started opening the cage door for her. One day in March, he opened the door and Annie ran into the surrounding woods. While Gregory and his girlfriend joked about Annie growing up and leaving for college, it still hurt to say goodbye. “I didn’t see her for about a week and got pretty sad that maybe she wouldn’t ever come back,” Gregory said. But just like a kid moving away for the first time — Annie still wanted to come home for a free meal and to play with the dog. As sad as it was to release her last week, it was necessary. Look who came and visited us today! Haven’t seen her for a while. She seems happy with her freedom! Glad she’s making it out there on her own but still knows home. Their visit was brief, but it meant so much to Gregory to know Annie was happy and healthy. She came to say hello again today! “It warms my heart to know that she roams around but still enjoys home,” Gregory added. To learn more about Annie’s adventures in the wild, you can follow her on Instagram. 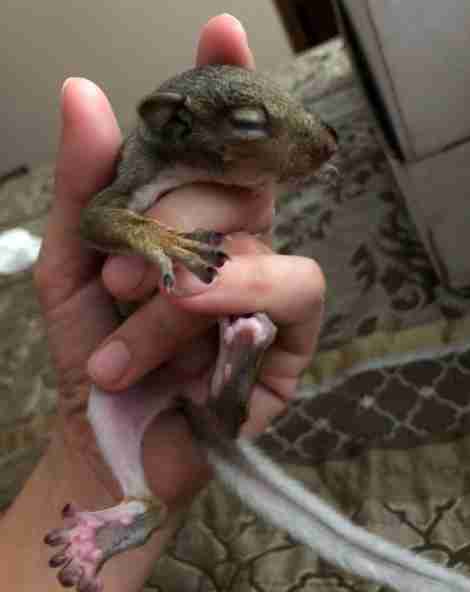 Baby squirrels require expert care so, if you find one who needs help, make sure to contact a licensed wildlife rehabber near you for help.